Barcamp JB is coming on this 6 & 7 December at Menara Cyberport JB. Barcamp is a great event which is a community driven event. I attended Barcamp KL, it is an awesome event. If can take your time to join in to this event. 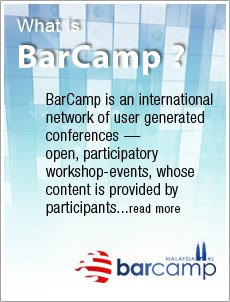 Unfortunately I won't be able to join in this Barcamp JB. ( A lot of Great event and wedding dinner in this few month for me) so for more details about Barcamp JB go to http://www.barcamp.my. There will be a competition and a iPhone 3G to be won. thing is sponsored by Ganesh, CEO of MOL Access Portal. media and do blog post about the event itself. Make sure you link back to www.barcamp.my and use the tag "barcampjb"
on your photos, videos and blog post. Please include BarCampJB's logo in your blog post. hope to see you in JB this 6 and 7 Dec.
only applicable for those who are attending the event. Visit www.barcamp.my for more info.